(Bloomberg) -- Indonesians began voting in a presidential election that’s seen jobs and the cost of living at the heart of the sometimes bitter fight for control of Southeast Asia’s biggest economy. Polling stations opened at 7 a.m. in eastern and central Indonesia, with about 193 million people eligible to vote. Unofficial quick count results by private pollsters are expected shortly after polls close at 1 p.m. Jakarta time. A re-run of the 2014 race, the contest again pits former furniture exporter Joko Widodo, now the incumbent, against ex-general Prabowo Subianto. Widodo, known as Jokowi, has vowed to create 100 million jobs over the next five years while Prabowo has tax cuts and a plan to revive Indonesia’s manufacturing industry as the key focus of his economic platform. Jokowi said he’s optimistic about winning today’s election after casting his vote at a polling station in Central Jakarta. "Just be patient," Jokowi said. "Wait for several hours and the result will be there." Former president Megawati Soekarnoputri also spoke to reporters after she cast her vote in the South Jakarta, reflecting on her time on the campaign trail. "Hopefully, whatever the result is, we would have fun," said Soekarnoputri who is also chief of the country’s largest political party, the Indonesian Democratic Party of Struggle (PDI-P). "I was participating in a presidential election. When I lost, I didn’t make a noise. Just laughed and feasted -- the result was the people’s choice." 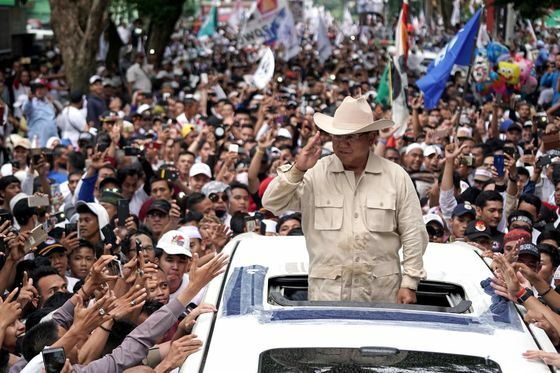 Prabowo says he expects to win 63 percent of the votes -- a prediction based on his party’s internal polling, which is in stark contrast to pre-poll surveys which point to a Jokowi win. Speaking after he voted in his electorate of Hambalang, near Bogor, he promised to cut the prices of electricity and food stuff in his first 100 days in office. He also vowed to protect the country’s resources and stop corruption. "I promised that we will work for the good of the country," Prabowo said. "If there is chaos or not, it will not come from us, that I guarantee. But we don’t want to be cheated anymore, the Indonesian people won’t be cheated anymore." Crucially, it’s also the country’s first simultaneous presidential and legislative elections. It will not only decide who leads Indonesia but will shape the parliament, and therefore the landscape for reform -- as well as the investment climate -- over the next five years. Inflation is at a near-decade low and the jobless rate close to its lowest in 20 years. Still, the economy has been growing at about 5 percent and well short of the 7 percent target put forward by Jokowi when he entered office in 2014. 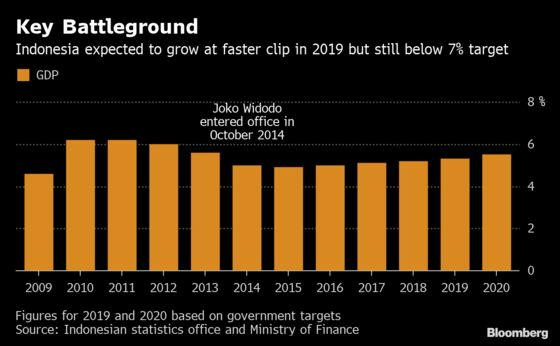 That’s left Jokowi open to attack, with Prabowo railing at the level of economic growth as well as Indonesia’s ballooning current account deficit, which last year was near 3 percent of gross domestic product. Prabowo -- who helped bring Jokowi to national prominence by backing his successful bid in Jakarta’s gubernatorial race in 2012 –- has for his part tried to paint a picture of disparity in the economy. “The big advantage Prabowo has this time compared to last time is that Jokowi was full of potential and people could respond to him and project into him their hopes and aspirations,” Greg Barton, professor of global Islamic politics at Deakin University in Australia, said ahead of the vote. But Jokowi now has “some scratches and dents” from his first term, he said. Two years ago, the Prabowo-backed pair of Anies Baswedan and Sandiaga Uno won a divisive gubernatorial election in the capital Jakarta. 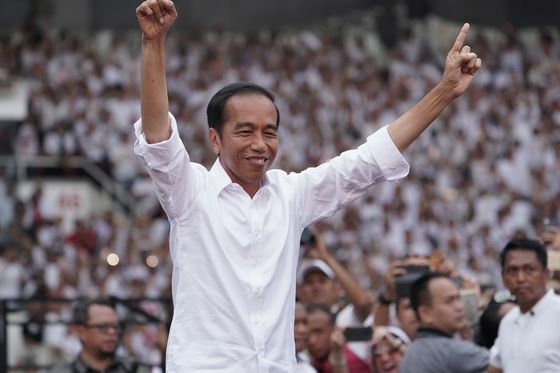 That race, dominated by mass street protests aimed ousting then-incumbent Basuki Tjahaja Purnama, a Chinese Christian and Jokowi ally later jailed for insulting the Koran, is seen as having boosted Prabowo’s stocks ahead of his 2019 run at the presidency. It’s also seen the 2019 election race set against the backdrop of a growing influence of conservative Islam in the world’s biggest Muslim-majority nation, and to many observers prompted Jokowi to pick a leading Muslim cleric in Ma’ruf Amin as his running mate. That move, according to Barton, tipped Prabowo toward picking Uno, a U.S. educated businessman. It also put him “on a trajectory towards talking about the economy,” Barton said.